A single-player refresher course in Aria's "one rule" launching on November 27. 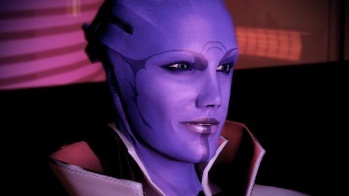 While Mass Effect 3 did what most people would argue is a good or satisfactory job of resolving its numerous sideplots and character dilemmas (let's all be friends, now), one character the game left conspicuously quiet was Aria T'Loak, an asari gangster who ran the Omega space station until Cerberus stole it from her. Now, according to Eurogamer, BioWare is set to release a giant hunk of DLC that tells the story of Shepard and Aria heading back to Omega to set things straight. The DLC will follow on from the story of the Mass Effect: Invasion prequel comics, with General Petrovsky himself apparently making an appearance on the Omega station. "New enemies," specifically the Cerebus Dragoon from the Retaliation multiplayer pack, will also be in attendance. Interestingly, according to Eurogamer's report, the DLC will also see the introduction of the series' first-ever visible female turian. Whether she'll just look like Garrus in drag or not remains to be seen, but regardless, her inclusion should make an interesting departure from the usual suspiciously-one-hundred-percent-male turian species. With that in mind (and because it's almost the weekend), I'd like open the thread, if I may, to hastily-drawn examples of what the Escapist hivemind imagines a lady turian to look like. They won't be terrifying or anything, right? Right? Mass Effect 3: Omega will launch for PC, Xbox 360, and PlayStation 3 on November 27 2012.